Breakfast in households with children (and adults who eat like kids) combine two of the biggest money makers in America. Sugary cereal and obesity. And if cereal giant General Mills has its way, the latter will get a whole lot smaller. Wednesday, Big G, the cereal division of General Mills and the makers of popular brands Lucky Charms, Cocoa Puffs and Trix, announced that it was reducing the amount of sugar in many of its most profitable brands that are marketed to kids. Ten cereals in all will go on a diet, with the goal of reducing the sugar grams within to the mere single digits per serving. The reduction could prove substantial. For instance, the sugar in Cocoa Puffs could dip 25% lower than it was a few years ago. "This is a significant development across some of our biggest and longest-term brands," Jeff Harmening, president of the company'sBig G cereal division told the Associated Press. But this isn't the first time a cereal maker has taken steps to keep kids' waists from growing to unhealthy sizes. 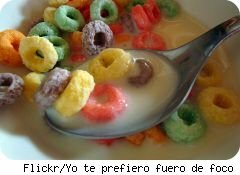 Kellogg's perennial favorites Froot Loops and Apple Jacks cut 1 to 3 grams of sugar per serving. A move that went pleasantly unnoticed by many discerning palates (at least in my house). Post Food also reformulated its recipes, slashing 20% of the sugar from both Cocoa and Fruity Pebbles. Trimming the sugar has captured the attention of parents. "I won't buy sugary cereals because I worry about my kid's weight and teeth," says mom of three, Jill Monroe. As a result, breakfast time is usually a battleground. "One doesn't like oatmeal and another is allergic to eggs. Sometimes pouring a bowl of cereal [that's healthy] would be a welcome change," says Monroe. "And none of them like the high-fiber, all-bran healthy cereals." So many days Monroe's kids get left-overs or PBJs for breakfast. "It's better than fighting with them to eat the so-called "healthy" grain cereal," Monroe says. Experts agree; food fights aren't productive. But parents need to be clear: General Mills isn't slashing its sugar content out of the goodness of its heart. As with most things these days, this move is all about the marketing. The Rudd Center for Food Policy and Obesity recently published a study that found the least-healthy breakfast cereals are the most frequently and aggressively marketed directly to children. It also found that General Mills, the maker of six of the 10 least healthy cereals, markets to children more than any other cereal company. Health experts have long cautioned against excess sugar consumption, one of the leading causes of obesity. And since these cereals are marketed to -- and frequently consumed by -- children, it's not a stretch to link them to the rising rates of childhood obesity. According to the National Center for Chronic Disease Prevention and Health Promotion, obesity among children aged 6 to 11 has more than doubled in the past 20 years, going from 6.5% in 1980 to 17% in 2006. The rate among adolescents aged 12 to 19 more than tripled, increasing from 5% to 17.6%. The ballooning sizes of kids is one reason analysts speculate obesity-related health care costs will cost Americans about $344 billion in expenses by 2018. "There's nothing nutritious about sugar so the more I can cut it out of their diets, the better," says Monroe. "But, I'd also like to cut out some early morning whining and have them enjoy breakfast once in a while." Hopefully, Monroe, and the scores like her facing a breakfast battle tomorrow, will soon have some healthy -- and nutritious -- options. Sound off. Do you think cereal makers should scale back their advertising blitz aimed at kids? Will you consider buying cereals made with less sugar? Gina Roberts-Grey is a freelance writer specializing in health, celebrity and consumer issues.